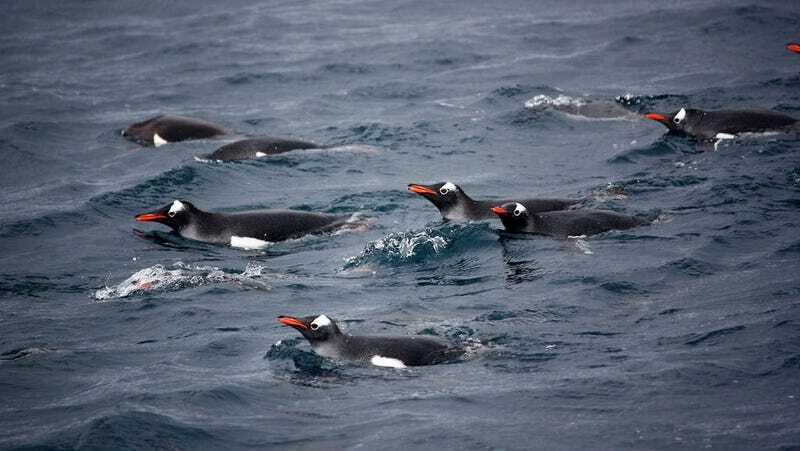 When Gentoo penguins swim into the open ocean to hunt for food, they often produce wierd buzzing sounds that marine biologists assume is a form of communication. By strapping cameras to the backs of these aquatic birds, scientists have finally figured out the purpose of these odd vocalizations. Penguins make all sorts of strange grunts, squeals, and chirps, and that’s because they’re so-called “colonial breeders” who live in complex social groups. These birds use their vocalizations to find a mate, identify offspring, and guard territory. But they also make distinctive buzzing sounds when they’re searching for prey in the frigid Antarctic waters. A new study published in Scientific Reports is the first to provide observational evidence of Gentoo penguins making these offshore vocalizations in the wild, demonstrating how these calls are affecting their behavior. Intriguingly, these calls are used to keep the hunting pack together, which may increase their chances of finding prey. Gentoo penguins (Pygoscelis papua) live in the sub-Antarctic islands and Antarctic region, and they like to hunt for fish and krill (tiny shrimp-like crustaceans). Studying these aquatic birds in the wild is not easy, however, as they prefer to forage in the freezing, choppy waters of the Antarctic. To get around this hurdle, a research team led by Won Young Lee from South Korea’s Polar Research Institute attached video cameras to the backs of these birds, allowing the scientists to capture their foraging behaviors. To place the equipment on the penguins, one researcher held a penguin with both arms while another deployed the camera. From 2014 to 2016, the researchers collected 598 offshore calls from 10 individual penguins near King George Island in Antarctica. The team then analyzed the acoustic characteristics of these calls, and linked them to various actions, including diving patterns, group association events, and foraging behavior. In nearly 50 percent of cases, individual penguins banded together to form a pack within a minute of an offshore call. Importantly, these calls didn’t alter the frequency of foraging dives, or other hunting strategies. Rather, it was a kind of “touch base” that brought the hunting party together. 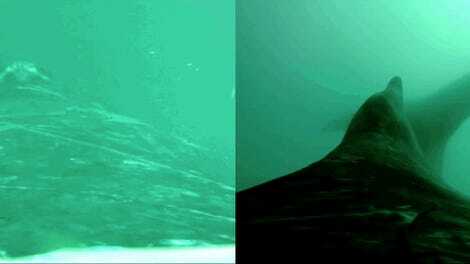 After producing these sounds, the penguins participated in shallower and shorter dives than before the calls. Also, they traveled to new areas instead of loitering at the same tired spot. This grouping behavior is reminiscent of other species, but Lee says it would be a mistake to compare Gentoo penguins to aquatic mammals. Will we ever learn to speak dolphin?